Married… With Children ran from 1987 through 1997, which meant for 11 years of my life my Sunday nights were spent with the Bundys. I grew up in the Midwest which also the region of the country MWC was set in. Aside for the actors being great in their roles and good writing, I would attribute the show’s successful run to its relatability. It seemed like every other family sitcom before Married had parents that got along and were in a rewarding professional vocation. I can’t speak for the whole Midwest, but my family was way closer to the Bundys than it was the Huxtables. This is a card that I’d thought of before but I’d not seen to many through the mail autograph successes in recent years for Ed O’Neill outside of preprint stuff. That changed when a friend I’ve met through doing my cards told me he may be able to get me an Ed O’Neill autograph in the near future if the right stars align. That was enough for me. 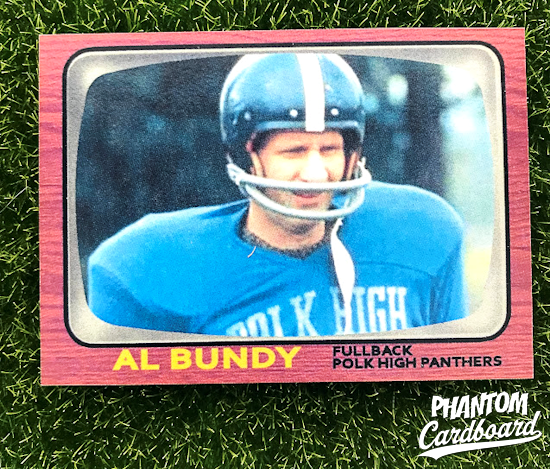 I watched some old clips of Married… With Children to try and nail down a year for my Al Bundy Polk High card, which in itself was worth the work that went into making the card. 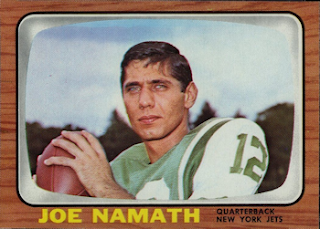 Al mentions in one episode that he “made all-city back in ‘66” which I later confirmed was the year that Al scored FOUR TOUCHDOWNS in the Chicago City Championship game. So, now I had a year to work with. There’s not a wealth of images available of Al in his Polk High uni. This one I think works because it’s not the best quality screen grab which is okay seeing as this is supposed to be from 1966. He’s got a helmet on which I think helps him pass from his younger self and not the woman’s shoe salesman that life has chewed up and spit out. The 1966 Topps football (and hockey) had an old-timey wood console TV design. The challenge with that was matching the wood’s finish. I found that to be just as hard as trying to match wood furniture. Mine is not an exact match, but that’s not to say I’m not dissatisfied with the finished product. I’d like it to be as close as possible and I tried a number of things stopping just short of throwing my laptop. Again though, I think I did Al “Touchdown” Bundy justice. Get a copy of this card here. Or, I will trade straight up for this month’s Biguns magazine or episodes of Psycho Dad dubbed onto VHS. Let me know. Fun fact... Ed O’Neill was a defensive lineman during in college at Youngstown State, and the Steelers signed him as an undrafted rookie free agent in 1969, but he was later waived during training camp.